I did my first batch mooncake last year. However I did not manage to blog about it. Too many things happened and I am not sure have I done it right and I did not do a lot . One of the fail is the Shanghai Mooncake I tried last year. Too much of parmesan cheese and I find it too strong the smell and I can not eat it myself. I did the filling last year with purple sweet potatoes and taro paste. However I do not think I have cooked them long enough hence the paste seem to be watery and my mooncake does not last too long. Well is all a learning process. This year I decided to buy some lotus filling and have it started early . So the moon cake has enough time to "breath" to become moisture and oily. 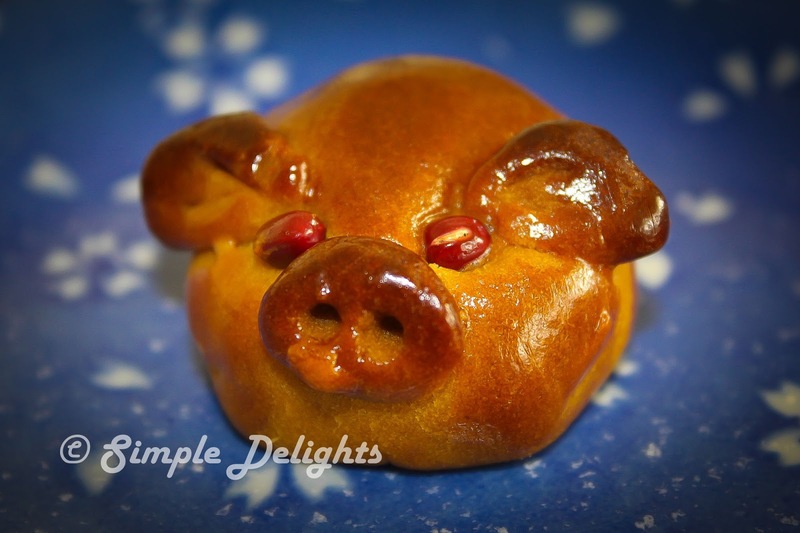 When I finally got to my PC and reload the page - there was the step of this cute little piglet mooncake. It seem to have create a fad of making this among the blogger. My piglet is a bit dark. Ya I sort of bake it too high and maybe a little over baked. My dear has been asking me during the baking session, " It seem burning! " , " Do you want to have a look ." "I think is time to let it out" . My respond is " Oh ya, is fine " ," No worries" . Ok that is the consequences of being err lazy !! For the Mooncake Recipe I follow ->Christine Recipe . It works well for me and easy to follow . I did not put egg yolk in my mooncake and I bought the Lotus filling from the store. 1. In a large bowl , mix in golden syrup, alkaline water and oil well to combine. 2. Sift in the flour , using a spatula to combine all ingredient. Be careful not to over mix. . Knead the mixture into a soft dough. Cover with film wrap and let it sit for 40 - 60min. 4. Divide the filling paste into equal portion as per the dough divided portion. Roll into ball shape. 5. Preheat the oven to 170C . 6. Roll each dough portion to a thin disc on top of a plastic film wrap. This is to prevent the dough on sticking on any surface. Place the filling into the dough paste and wrap it nicely and shape into a ball. 7. Oil the mooncake mould, gently place the stuff mooncake in the mould, press it with firm pressure to ensure the print is moulded to the mooncake. 8. I tab the side of the mooncake mould and remove mooncake from the mould . Place it on the baking tray. 9. Repeat the step till all the dough has finished with nice print. 10. Bake in the preheated oven for about 10 min . Brush the mooncake with egg wash, let it rest for 10 - 15 mins. Return to the oven and make for another 10-15 min with 160 C .
Once the mooncake has finished baking, it does not look right or good. It seem to be cracking and dry. Do not panic, this is normal. The mooncake need to be kept in air tight container for 4-5 days , to let it "breed" ( this is what I called) in order for the oil and the moist to release and you will have a nice coated golden brown mooncake to enjoy. 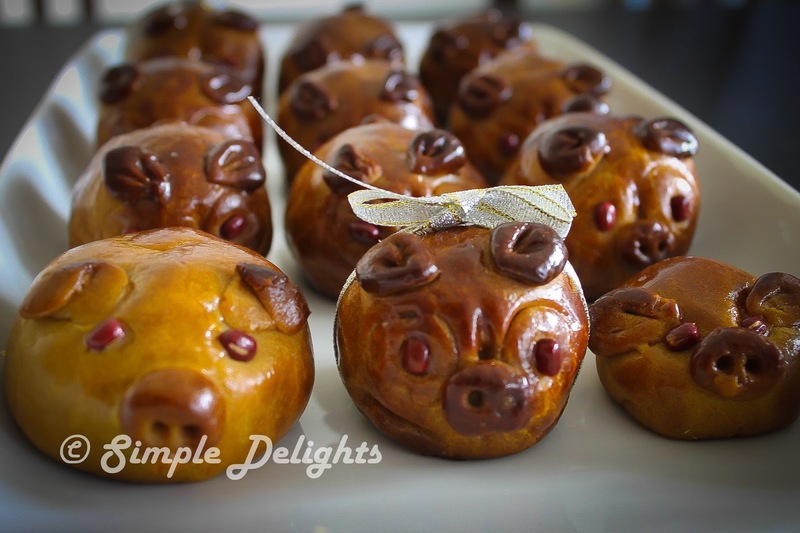 This process is important , as it make the pastry soften, fluffy and moist to enjoy . 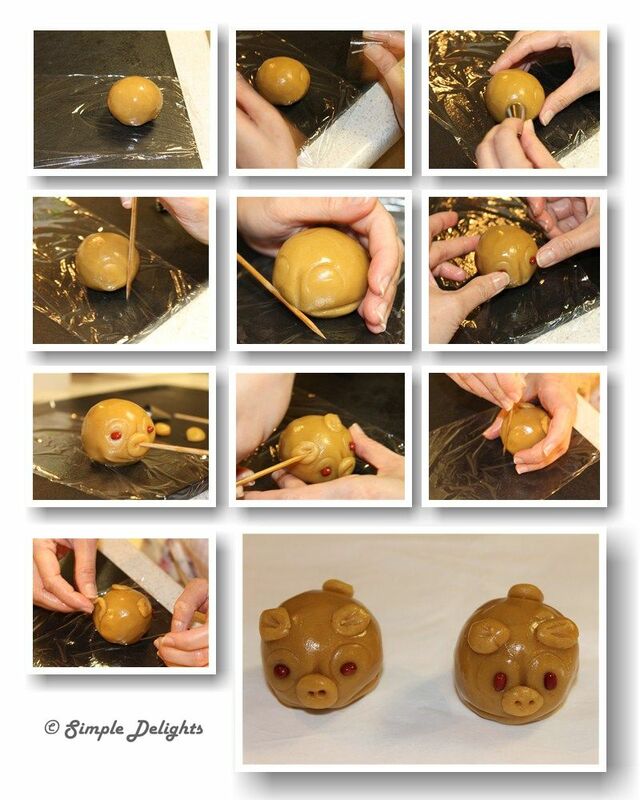 Step of making the piglet. You can follow the link in Anncoo ( Snowskin version). 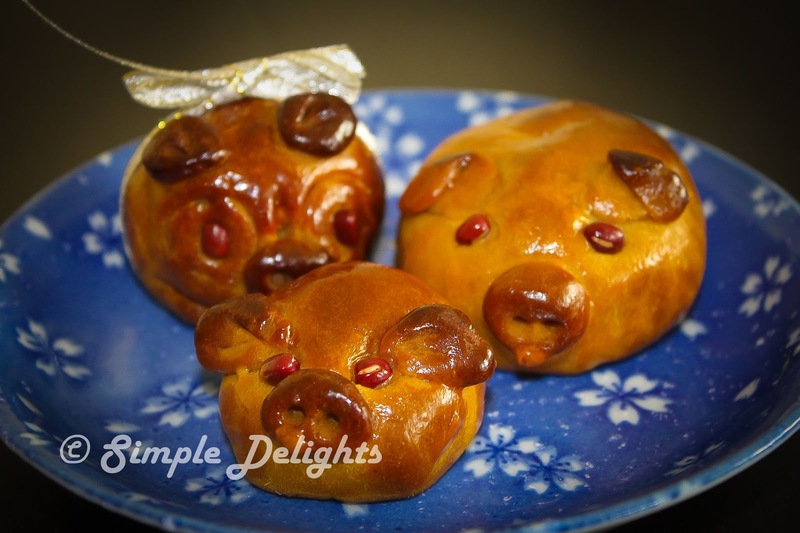 I have a few different filling for my mooncake this round Lotus, Red Bean and Chestnut. Love the taste of chestnut and is best to get those less sugar . If you read on the calories of each mooncake , at time it really stop you from eating. 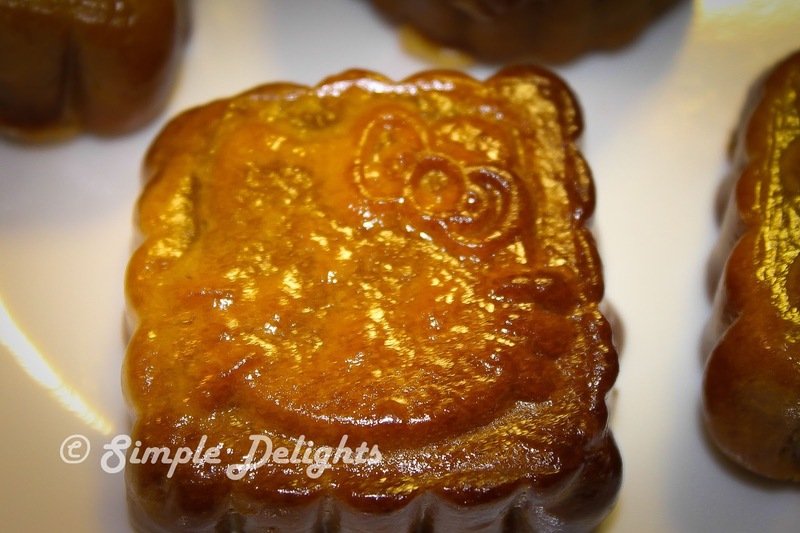 I will post my Jelly mooncake in another post. Wish everyone a Happy Mid Autumn Festival.